What type of coax cable should I use for my television? First figure out what you're installing it for. If you're putting it in to run regular cable television (CATV) or master antenna television (MATV), you don't need coax with special sweep-testing. The signals from these types of inputs are very strong. If you're planning on using satellite television (SATV), however, you'll want to make sure that you use coax that has been sweep-tested to 3GHz as recommended by most satellite service providers. In any of these cases, you want to use RG-6. Then it comes down to the shielding. 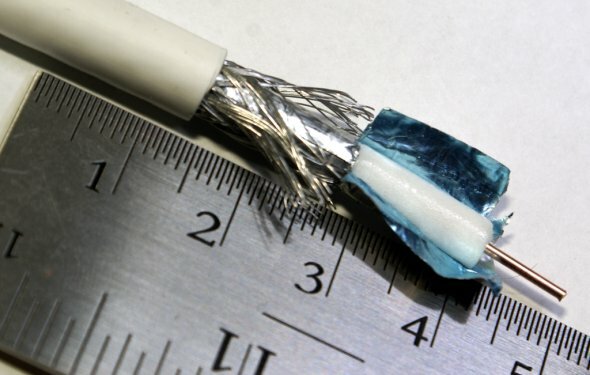 Coaxial cable has two types of shielding: a foil and a braid. A 40% braid is a loose braid and is the most economical. It is generally used in places like motels where getting perfect reception isn't terribly important because people will only be there for a night or two. A 60% braid is the standard braid for RG-6. Most professional installers use RG-6 with a 60% braid. Quadshield coaxial cable has two foils and two braids. RG-6 Quadshield is the premium choice for RG-6 and is used by most people who have the chance to choose the cable for their own systems. The type of conductor in your coaxial cable will also be important. The two conductors you will find in coax are copper clad steel (CCS) or solid copper core (SCC). Copper clad steel will be suitable for most installations, but if you want the best signal possible, then you should look to purchase a cable that has a solid copper conductor. The stronger signal produced by a solid copper conductor is ideal when you are using a satellite signal or you are looking for the best signal for your HDTV. The copper clad steel conductor will work for both satellite and HDTV, but to make sure your signal is as strong as it could be, then use the solid copper conductor. Another thing to look for is UL listing or ETL verification. This independent testing ensures that cable actually is what the seller or manufacturer claims that it is. There is a lot of bargain coax out there without any sort of independent testing mark, so you'll want to specifically ask about this before making a purchase.